More stories about growing up in the author’s rural southwest Virginia family during the first sixty years of the twentieth century. These family adventures are sure to make you laugh. 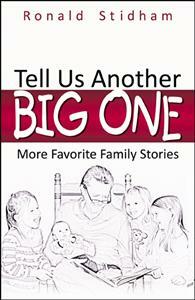 Part memoir, part good old family stories, and part tribute to a wonderful family, Tell Us Another Big One: More Favorite Family Stories, is all that and more. In this, the second book about life in the author’s large family during the first sixty years of the twentieth century, you’ll find more stories about how the close, but mischievous, family members lived, worked, and played in rural southwest Virginia. Join four generations of family members and their colorful neighbors for some old-fashioned adventures and misadventures. Their stories are sure to make you laugh.